Trane Packaged Systems maximize the efficiency of two machines in one sleek unit. These provide a heating and cooling solution in certain regions where homes only have a single cabinet with limited space for a split system. Choose from all-electric systems, gas/electric or the dual fuel option. These systems combine heating, air conditioning and air-handling functions into one unit. With a heat pump packaged system, you’ll be comfortable during every season. These packaged systems work well in all types of homes, and they work best in areas with mild winters. Heat pumps offer a heating solution for homes with no access to natural gas. If you need a reliable, efficient solution for heating and cooling, you’re in the right place. 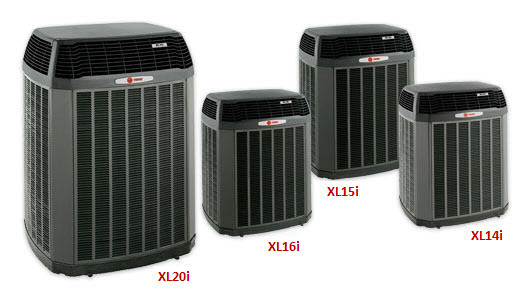 As the name suggests, heat pumps move heat from one place to another. Even in air that seems cold, heat energy is present. When it’s cold outside, heat pumps extract outside heat and transfer it inside. When it’s warm outside, they reverse this process to push unwanted heat outside. An HVAC air handling unit (also called an AHU) is the indoor part of your heating and cooling system. An air handler circulates both cool and hot air, depending on the season. When properly matched with a heat pump or air conditioner, an air handler will help you maximize the overall efficiency of your HVAC system. We have a range of solutions so you can find the right air handler for your home. Air conditioners and refrigerators work the same way, expect an air conditioner cools a room or a whole building. Air conditioners use chemicals that easily convert from a gas to a liquid and back again. This chemical is used to transfer heat from the air inside of a building to the outside air. The machine has three main parts: a compressor, a condenser and an evaporator. The compressor and condenser are usually located on the outside air portion of the air conditioner. A natural gas furnace converts gas to heat. Gas furnaces are the most popular choice for the majority of modern homes with central heating and air conditioning. Keep in mind, you can only use a gas furnace if you have a gas line hooked up to your home. Ideal applications for a split-zoning system include bedrooms, garages, or bonus rooms, just to name a few. There is little to no ductwork required so you don’t have to worry about disorder in your home interrupting your life or costly remodeling expenses. The sleek indoor unit mounts discreetly within the space, and a pair of refrigerant lines plus power and control wiring connect it to the outdoor unit through a small opening in the wall.